thank you for visiting the Islamic Center of the East Valley(ICEV) website. We are located at 425 N. Alma School Road, in Chandler, Arizona (between Erie and Galveston on Alma School Road). ICEV began its journey with the purchase of land in 1996. Alhamdulillah, the Masjid is in full operation since Ramadan 2009. ICEV now has a full time Imam who leads the daily prayers (please check prayer times on the right). Imam Ahmed Moharram is an Al-Azhar educated scholar and Hafiz. Jumah khutbas are offered by the Imam and other scholars in the community. 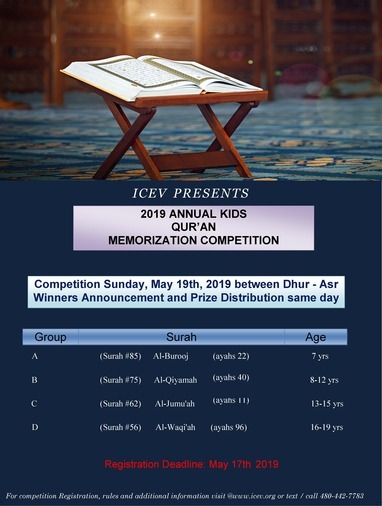 Many programs are on-going at ICEV at the present time including activities emphasizing a) Memorization of Quran, b) Tajweed lessons, c) Halaqas focusing on various Islamic topics, d) Dawah programs, e) Youth programs, and f) Sunday School. Please check the event calendar for additional details about the program. Please feel free to browse the website and review the organizations history captured in photos and documents. Also, please feel free to review the ICEV bylaws. If you have any questions, please contact the people that are listed in the contact page. a baldheaded poisonous male snake with two black spots over the eyes. 'Let not those who withhold.' (to the end of the verse). (3.180). Please make sure to register your child as soon as possible. Separate form for each kid. one form submitted with multiple kids names will be rejected. Registration dead line, May 17th 2019. Child should not have participated before in any competition on the surah. Child have previously participated anywhere for these surah’s are not eligible. Huffadh leading Taraweeh are not eligible for competition. Huffadh not leading Taraweeh (under 20 ) can only participate in last category for Surah “Waqiah" regardless of age. Children from all Masajids can participate as long they meet the competition rules criteria. Boys and Girls will read loudly in front of all audience. Boy’s recitation will be in main prayer Hall and girls in basement. It is important that the Masjid is quiet and without distractions during the competition. 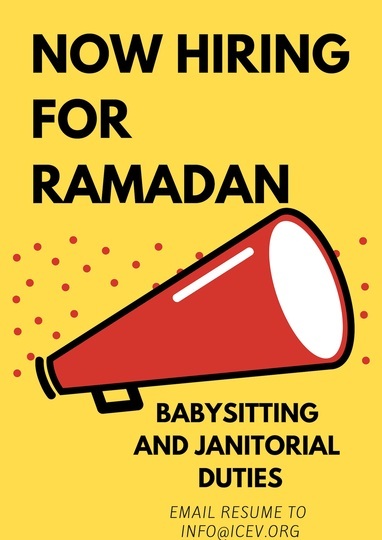 No babies, toddlers and young children are allowed in the Masjid during the competition. There is NO babysitting available for this event. Please make other arrangements for young children’s. Child cannot participate in more than one category. Child who are late/absent will be give second chance at the end of their category. Once Category is done, they cannot participate anymore. Tajweed rules will be judged by ‘Hafz’ Qira’at. If any child is following other Qira’at, inform the judges before recitation. If child has not memorized his/her part, he/she can recite from beginning of surah but 50% of Hifdh points will be deducted. The child will be called in the sequence registered. No child will be entertained out of sequence he/she has to wait for his turn. Islamic Center of the East Valley will host Produce On Wheels - With Out Waste (P.O.W.W.O.W.). POWWOW disburses fresh produce to communities throughout Central and Southern Arizona. All are welcome to attend. Open from 7:00 a.m. to 10:00 a.m.
By donating $12, community members may shop for up to 70 lbs of fresh nutritional rescued produce to share with family, friends, neighbors, or someone in need. Volunteers needed to assist with setup and assisting those attending with boxing, bagging and direct questions as needed. Please read carefully listed instruction for 2019 Ramadan Qur'an School Schedule and bring your child in designated session only. Regular Qur'an School sessions will continue till May 4th 2019. ICEV FNO 2019 Spring Semester registration is currently closed. To get ICEV Iqama (prayer) timing alert on cell phone via text message. To receive messages via text, text @iceviqama to 81010. You can opt-out of messages at anytime by replying, 'unsubscribe @iceviqama'. A full week program where children can learn how to read Quran. The main focus of the program would be to teach children Arabic reading of Quran. The classes will be self-paced and offer instructions from alphabet level to Mushaf reading level. Each student is expected to ‘graduate’ after one year of consistent attendance. Once the child graduates (goal 1 year), he/she can enroll in other advanced programs if desired. Students will choose only one session out of four choices available. Memorization of Surahs from Part 30 (Juz Amma) of Quran. Teach basics of Salah (prayer). A full week program where children can complete Quran Memorization. The main focus of the program would be to help children on Quran Memorization. The classes will be self-paced 6 days week except Friday. dedicated teacher for both girls and boys. Only one session throughout week and weekend. Assalam-alaikum ICEV Administration was looking at addressing the needs of the community for the Jumuah Prayers. Increase in community members and having limited space availability inside the Masjid became an aggravated issue. Besides this there has been continued requests for 2nd Friday khutbah to accommodate different scheduled needs of people who have limited time off from work, but would like to attend the salah' insha'Allah. Small, dirt lot is now open, please take advantage of parking there. Click here to view map. for Registration please æclick here. Click Here for 2019 ICEV Iqama Calendar. ICEV is a 501(c)3 tax-exempt charity.